We offer an Affordable Luxury 2 bedroom townhouse in Whistler Village North with PRIVATE HOT TUB. Conveniently located across the street from Marketplace in Whistler Village(Glaciers Reach Townhouse complex). Spectacular mountain views close to everything walk everywhere, within walking distance to base of Blackcomb, Whistler Mtn, trails, tennis courts, golf course, supermarket, drug/liquor/food stores, retail outlets, and video store. In-suite washer/dryer. Outdoor pool (heated), hot-tub, sauna, fitness room, free underground parking and bike storage. We enjoy hosting people from around the world, what an excellent opportunity to not only show case the worlds top ski resort but also our townhouse as well. We have pride in our property and keep it in top condition. We think we have a great location in not only Whistler Village, but also in the complex itself with terrific views. We have received many compliments from guests using our unit. In the short time we have been renting out our townhouse, we have received a considerable amount of repeat customers. We have been a member of VRBO offering rentals since 2009, that means we are a trusted rental property owner/manager. This property was chosen as it is the top of the line unit at Glaciers Reach, offering the largest sq.ft of 1045. It has vaulted ceilings and the private patio is on the 3rd level, providing lots of privacy!! When you arrive at our place, you have arrived and you will not have to drive anymore. 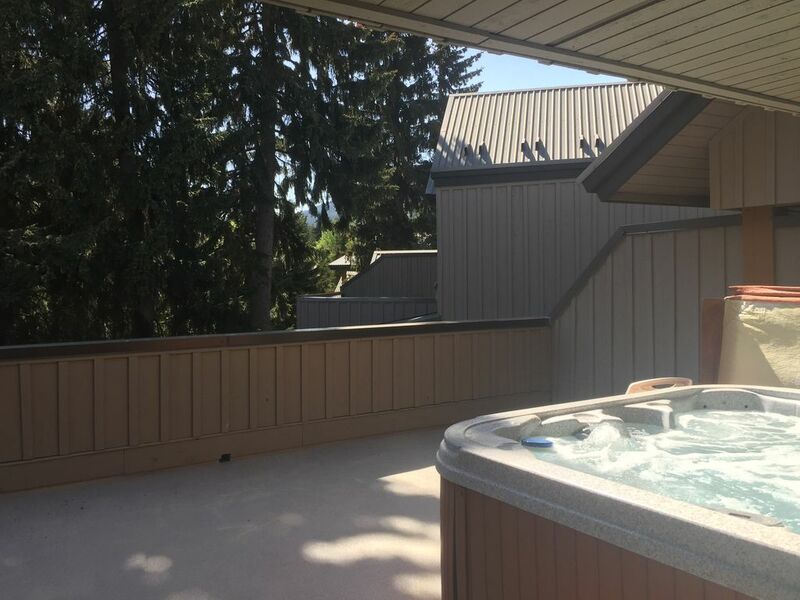 We have a private hot tub on one of 3 private patios, with lots of privacy as well. Located In Whistler Village North, ( directly across the street from the Liquor Store in Market Place Whistler Village). Fire place , ( gas ) and electric stirp heaters. High speed internet wi-fi, password given with checkin info, ( this is Shaw wifi, works good, it is not shared, it is for exclusive for our unit only ). Great access to ski shuttle and village of whistler! Fantastic stay! Owners were great at communication and very thoughtful. The kitchen was well equipped for cooking. Living area was spacious. We stayed with another couple and liked privacy of the second bedroom and bathroom. The hot tub was clutch for recovering from skiing. Easy walk to town or the slopes or you can take the free shuttle which is just a few hundred feet from the door. Especially convenient to the grocery and liquor store. Would definitely stay here again! Clean with all the amenities you need! We had a wonderful stay at this property! It was walking distance to the village and all the restaurants. And the shuttle to the base of the mountain was close and convenient and made it easy to get our kids to ski school every morning. The kitchen was equipped with everything we needed. And having the hot tub on the top deck was such a bonus. We used it every day! The owners were very responsive with any questions we had! We will definitely be back! My husband and I loved this condo!! The location is amazing! We walked to the lifts every morning, it was maybe a 10-15 min walk with our gear but we prefer walking to taking the shuttle. The shuttle stop is right across the street for those who don't want to walk with their gear. The place was perfect! Hot tub was the highlight! We will definitely stay here again! We love Whistler and even with the smokey air we had a great time. Experiencing the festivities of Crankworx, strolling through the village shopping, people watching, enjoying the Sunday Farmers Market and all the outdoor music set in this amazing mountain retreat is a must for anyone. This was enhanced but our stay in your condo. The condo is spacious, well air conditioned 😉, the beds were very comfortable, the towels were luxurious and fluffy and the hot tub was a perfect way to finish the day. I appreciated how clean it was, the extra supplies and the well maintained cookware. Thank you again for your prompt help with all my questions and concerns. Great place and close to the Village. There were 4 adults and two little ones and we had plenty of room. It was very clean and neat. The bedrooms were spacious and the large upstairs deck with the hot tub was a great place for everyone to enjoy the evening. It was 90+ degrees for most of our stay, so the A/C was very welcome! The kitchen had plenty of sauce pans and skillets and one of the little things we really appreciated was having plenty of containers for leftovers! Robert and Roy were great to work with - thanks guys! We all had a fantastic time!